Once again another year has ended, and we take a look back at a few of the many books reviewed in KRL in 2017. All but one of our main reviewers share in this post their top 5 favorite books they reviewed in 2017 (well some of them may fudge on that a bit). Our newest reviewer, Katherine Costa, wanted to also include favorite authors and TV shows she has reviewed, so hers went up in an extra midweek post. 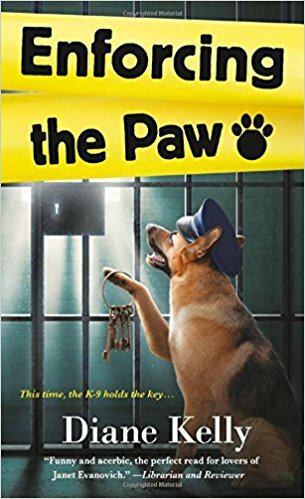 Enforcing the Paw by Diane Kelly-A perfect blend of grounded police procedures with canine appreciation. Chapters seen through K-9 officer Brigit sharp eyes are a delight, and they are seamlessly woven into “real life” dilemmas. The novel finds in human officer Megan’s new romantic relationship, while still depicting the serious challenges of police work. 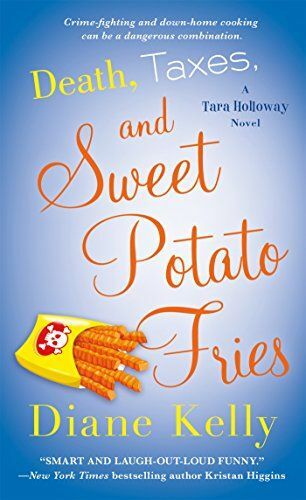 Death, Taxes, & Sweet Potatoes by Diane Kelly – Perhaps I love this latest in the series because I’ve adored following IRS agent Tara Holloway through all of her investigative and romantic adventures. Humor, action, and compelling financial shenanigans as our heroes explore new settings. The topic of illegal immigration has never been more timely. 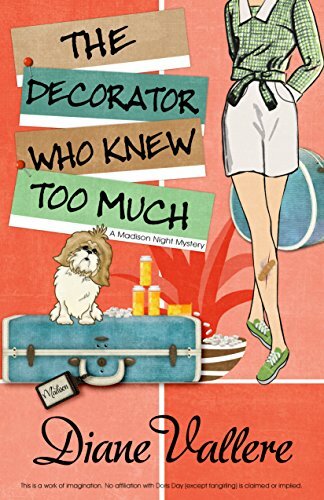 The Decorator Who Knew Too Much by Diane Vallere-Perfectly blends cozy fashion themes with the very real impact of PTSD. I truly appreciate this fun novel that doesn’t shy away from how an amateur detective would be emotionally impacted by continually being involved in murder investigations. 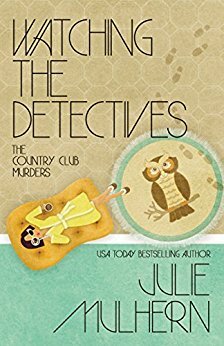 Watching the Detectives by Julie Mulhern-Susan Isaacs was one of my favorite authors, and this series brilliantly recreates that tone of domestic fiction. Set in an upscale community during the 70s, it perfectly delivers on the promise of satire while highlighting the growth of a relatable and very likable heroine. 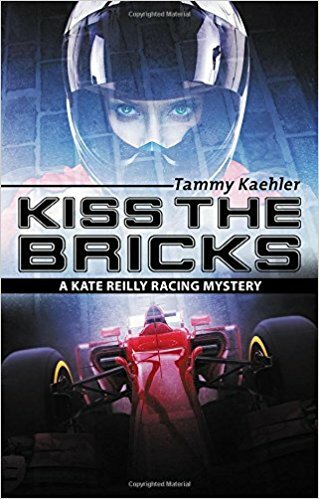 Kiss the Bricks by Tammy Kaehler-Extraordinarily original, this series features one of few top-rated professional female race car drivers. Kate Reilly’s struggle to accept that she is a role model for women seems so timely, and never more important. The world of professional race car driving is fascinating, especially when combined with the challenges facing women drivers. 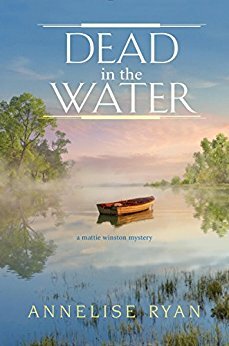 Dead in the Water by Annelise Ryan -One of my favorite series, I have loved seeing the growth of death investigator Mattie Winston. Her deadpan, black humor is fantastic, especially in light of the death and tragedy she sees daily. The laughs continue throughout, yet they never lessen the fascinating study of forensics. 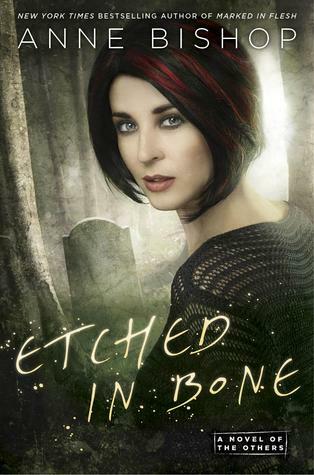 Etched in Bone by Anne Bishop—Fifth in the Others series, the Courtyard of Lakeside has become an embattled refuge. The shifters, vampires, and elementals are blamed for the destruction caused by The Others, even though it was brought on by the humans trying to destroy the Courtyards. Meg, the blood prophet who sees the future in metaphors in pictures or when she cuts her skin, is still confused by her feelings for Simon Wolfgard, and the shifter is even more confused by his feelings for her. The series always surprises me, and the expanding cast of supporters and adversaries manages to remain distinct individuals, and the storylines make sense. 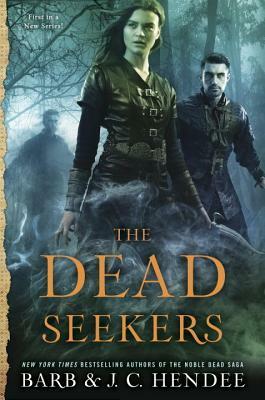 The Dead Seekers by Barb and J. C. Hendee—First in a new series from the Noble Dead creators. Tris can capture and banish spirits. Mari, who can turn into a wild cat, thinks he controlled the spirits that killed her clan, and she wants to kill him. This odd couple are obviously meant for each other. Their strange feelings (Is this something of a theme for me?) confuse them. 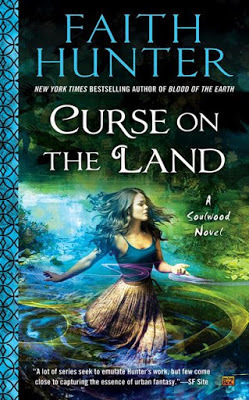 Curse on the Land by Faith Hunter—Hunter was already a favorite for me with her Jane Yellowrock series, but the Nell Ingram spin-off really gets my vote for cool. Nell communes with the earth and makes plants feel better about themselves. Her second book outing finds her stepping outside of her polygamous-sect upbringing as a member of a paranormal group of investigators. There are Nazi legacies, killer fungi, and people behaving like crop circles, and…oh yeah, she has strange feelings. 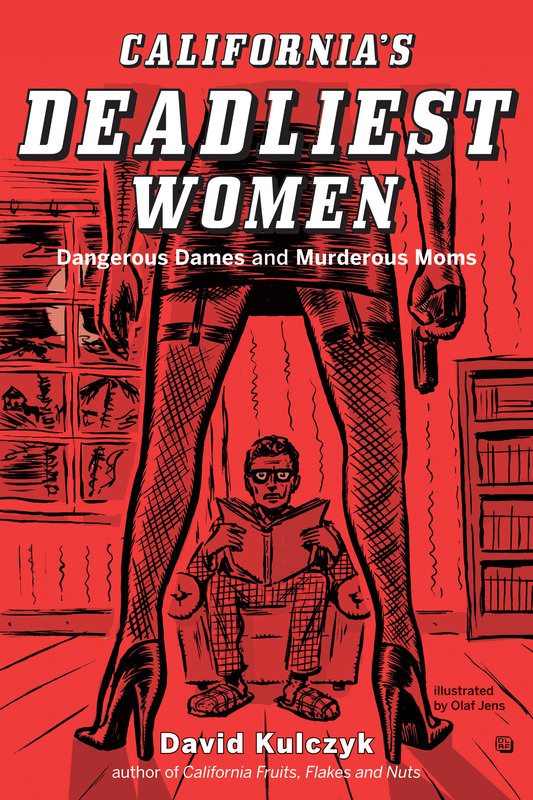 California’s Deadliest Women by David Kulczyk—I don’t review a lot of non-fiction, but this journey down the Memory Lane of the Golden State’s female murderers took me by surprise. From gun-toting gals to cannibal chicks to drug-crazed dames, you’ll find a lot of ways to kill a man…not that it’s meant as a how-to book. 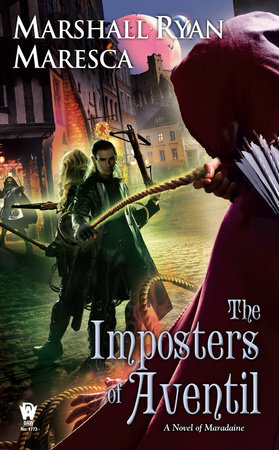 The Imposters of Aventil by Marshall Ryan Maresca—The Thorn has gone from attacking drug traders to killing cops…or has he? My favorite mage-vigilante is tracked down by my favorite mage-detective and his female partner, while drugs cause trouble at an intercollegiate competition. I’m so glad Maresca finally gave his readers a crossover book. Trumpet of Death by Cynthia Riggs-Victoria Trumbull may be ninety-two years old but she’s not sitting at home waiting for something to happen. She’s apt to be out and about, making it happen. 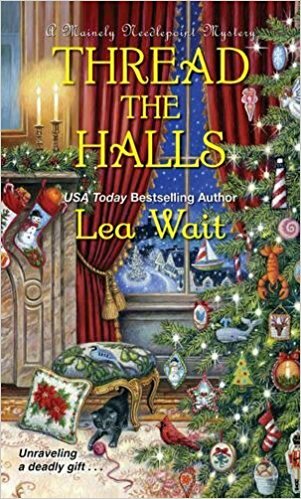 Thread the Halls by Lea Wait-Angie and Patrick have been dating a few months now so this will be their first shared Christmas. Angie has it all planned until Patrick asks for a favor or two or ten. 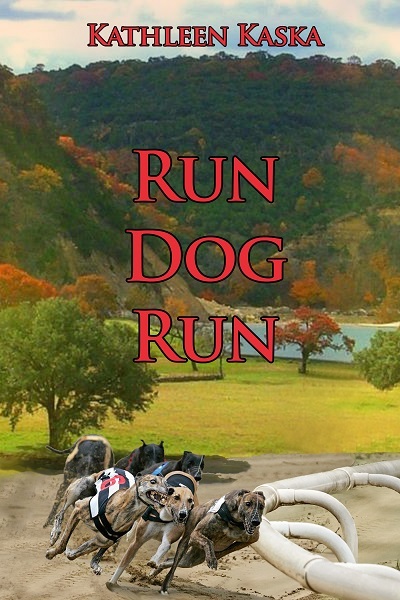 Run Dog Run by Kathleen Kaska-Kate Caraway loves her life in Kenya. She’s working on a research project involving the diminishing number of elephants and making progress until she meets up with four poachers. Things go badly, enough so, she and her husband have to leave the country in a hurry. After years away from the US, where can she call home? It seems like the Texas Hill Country would be a relaxing spot. She’s wrong. Shadow Girl by Gerry Schmitt (Laura Childs) (Thriller)-For readers who love Theodosia, Drayton and Haley from the tea shop books, Carmela and Ava from the scrapbook series, and Suzanne, Petra and Toni from the Cackleberry Club, this is a departure from the cozy mysteries you’re used to. Schmitt (Childs real name) has turned to thrillers. Her first, Little Girl Gone, is about a kidnapped baby. 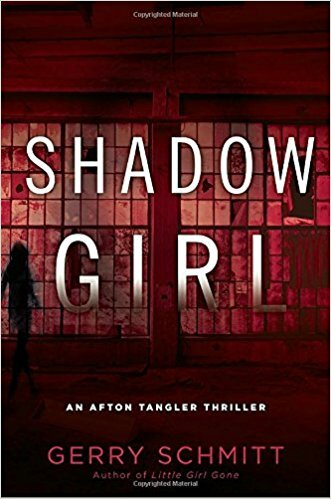 Shadow Girl starts with a bang as a helicopter is blown up as it comes in for a landing at the hospital. On board were the two pilots and a donor heart. From there, the action never stops. 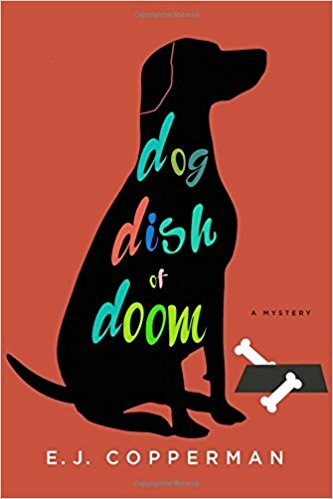 Dog Dish of Doom by E. J. Copperman (New Series)-Kay Powell has an entertainment background. Her mom, El, and dad, Jay (J, K, L, get it?) were performers in the Catskills and now on cruise ships. Kay did her part for years until she felt too grown up and wanted to go to veterinary school. She ended up in law school instead. However, that can be managed if you go into a career of being an agent for animals. 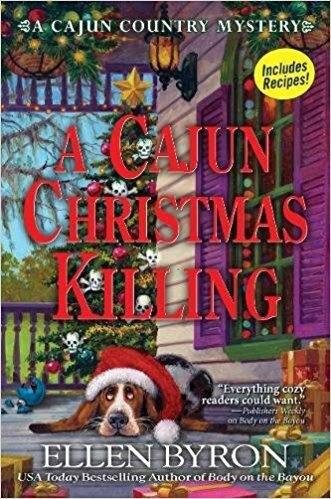 A Cajun Christmas Killing by Ellen Byron-Maggie Crozat is working her usual twenty-seven jobs, or at least it feels like that many. For one, she sells baked goods and soft drinks on the levee to raise money for porta-potties. Between Thanksgiving and Christmas Eve, each of the plantations build a big bonfire and try to outdo each other. They can be thirty feet tall, a pyramid of logs or something as artistic as a miniature of the plantation’s manor house. Porta-potties are essential. What could go wrong? 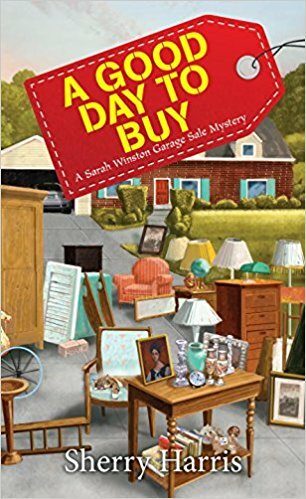 A Good Day to Buy by Sherry Harris-Sarah Winston can fix you up with your garage sale, from deciding what to sell, how much you’ll get and providing everything you need to let go of your stuff. Of course, not every sale runs smoothly, especially when the seller turns up dead in the garage, his wife by his side, knocked out. 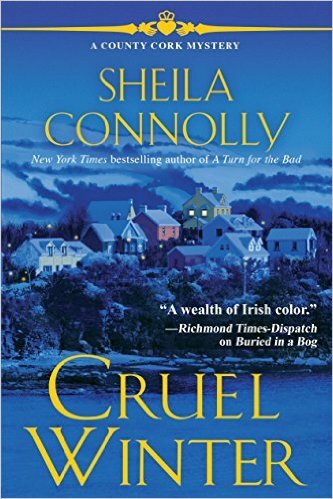 Cruel Winter by Sheila Connolly-Maura left Boston after her grandmother’s death, just to visit Ireland. Gran wanted her to see the old country and let distant relatives know she’d died. What was to be a visit, has turned into a new life. Moira inherited a pub, three employees, a daily storytelling fixture of a customer and a house too. It seems she’s here to stay, at least for now. Winter’s here and a big storm is on the way. 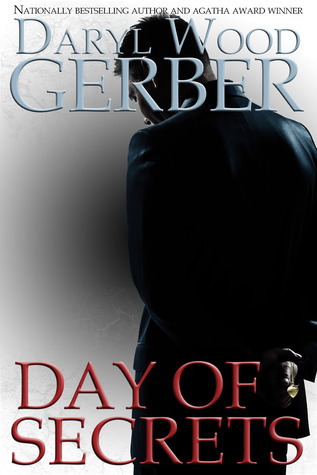 Day of Secrets by Daryl Wood Gerber (Thriller)-Chase Day is a history professor, former Navy, and presumably an orphan, raised by his grandmother. His mother was killed in a fire over thirty years ago. He never knew who his father was. Most times, getting term papers graded and returned before the holidays is his biggest concern. It was that way until he got a phone call—from his mother. She asks him to come to the house trailer where they lived once upon a time and that’s when it all hits the fan. 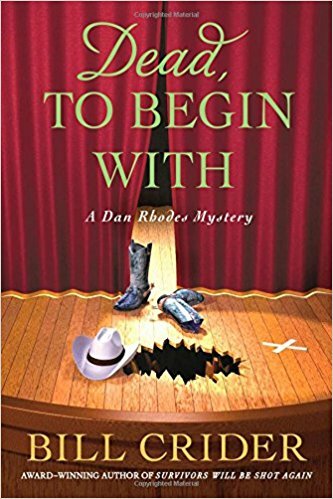 Dead to Begin With by Bill Crider-Jake Marley has been a recluse for as long as anybody can remember. His sister was killed in a car accident when he was just a kid. After that, things were never the same. The townspeople of Clearview, Texas are more than surprised when Jake buys the old Opera House with plans to open a theater. Like Jake, the Opera House has been left to its own devices for far too long. Before plans can really get under way, Jake’s body is found at the Opera House. Sheriff Dan Rhodes decides to treat it as a crime scene, just in case. As usual, he’s right. 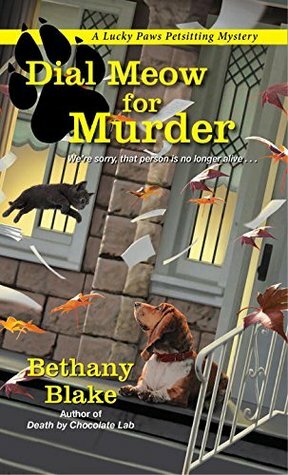 Dial Meow for Murder by Bethany Blake-Daphne Templeton majored in philosophy. Working as a pet sitter/dog walker, her mother thinks she’s woefully underemployed. Her sister, Piper, is a veterinarian. Daphne had been staying with her but is now moving into a tiny cottage on the property with her Basset Hound, Socrates. 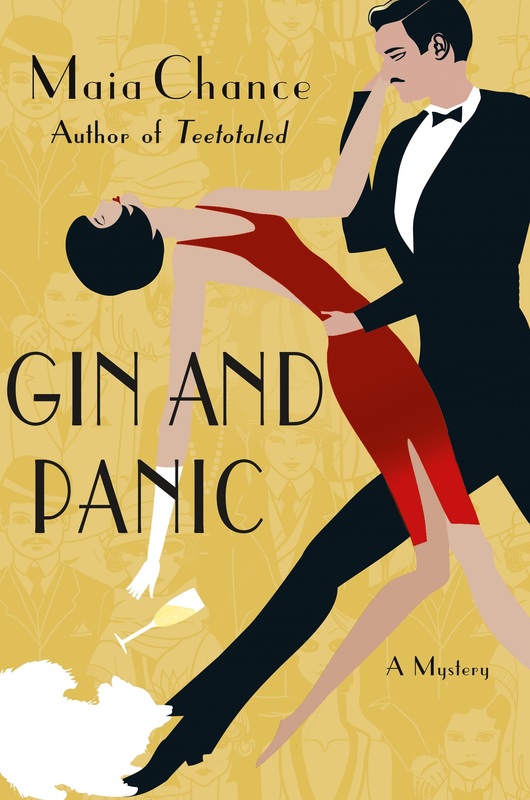 Gin and Panic by Maia Chance-Lola Woodby is an ex-Society Matron. When her cheating husband kicked the proverbial bucket, she was left penniless. What’s a gal supposed to do? Lola formed the The Discreet Retrieval Agency with her former cook, Berta, as her sidekick. As a cook, Berta is excellent. As a sidekick, she sometimes seems more in charge than Lola. Still, the gumshoe business is a good fit for the both of them. Set during Prohibition. 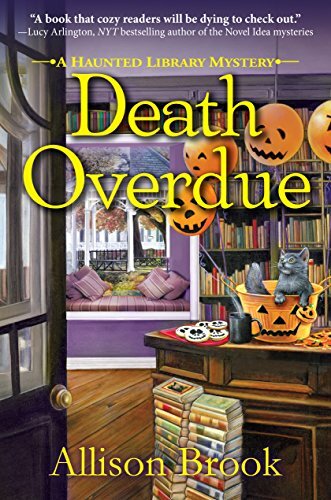 Death Overdue by Alison Brook (New Series)-Carrie Singleton moved back to Clover Ridge, Connecticut temporarily and works at the library. Carrie is surprised to see an elderly woman, Evelyn Havers, mainly because Evelyn died years ago. While most people would scream and run, Carrie takes the news calmly, at least until a man dies during her first event. 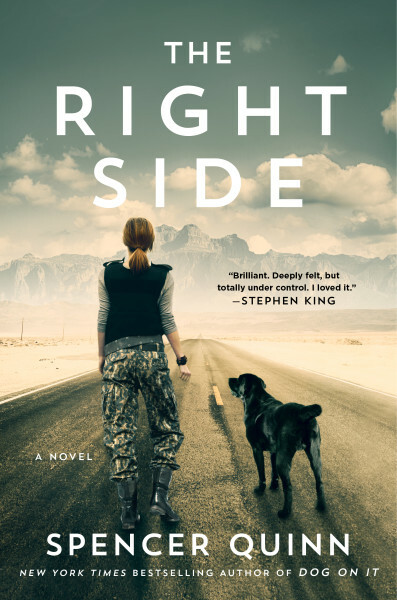 The Right Side by Spencer Quinn (Not Chet and Bernie)-LeAnne Hogan was someone to watch in the military. Sent to Afghanistan, she worked with the local people through an interpreter. Local women felt more comfortable around her than male soldiers until she shot and killed a suicide bomber at the opening of a center for women. For readers who enjoy the Chet and Bernie series of books Quinn writes, this is totally different. It’s suspenseful, a thriller, a mystery, a tale of a woman and a dog who saves her when she thought she’d saved the dog. It’s a story of healing. It’s a story you won’t want to put down. 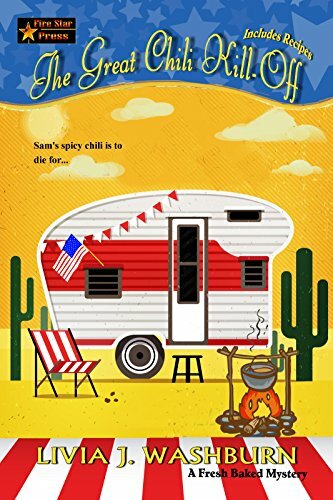 The Great Chili Kill-Off by Liv Washburn-Phyllis, Sam, Eve, and Carolyn are off to a West Texas ghost town for what is advertised as the world’s largest chili cookoff. Texans take their chili seriously. An explosion and a death may cause a distraction but the chili must go on. Once again I didn’t review nearly as many books as the rest of the KRL crew–I only reviewed 11 books this year (not including a children’s picture book and a cookbook). So there doesn’t seem to be enough for me to pick a top five group, but I loved every book that I reviewed and will give you just a quick look at each of them. No best books list would be complete without a Coffeehouse mystery by Cleo Coyle-this year’s was Dead Cold Brew. Marcia Muller has been a favorite of mine since my early twenties and remains so–I loved how her latest book, The Color of Fear, dealt with racism. 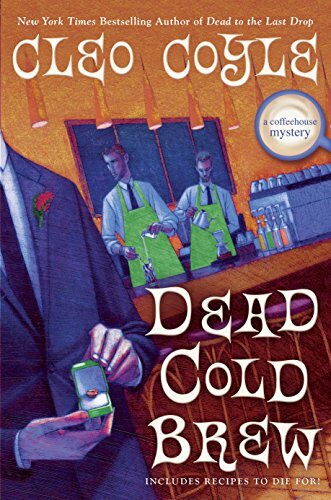 I also enjoyed getting to read the latest Tempe Crabtree mystery by Marilyn Meredith, A Cold Death– her books are always a fun and fast read. 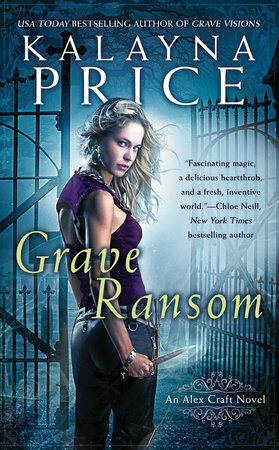 Grave Ransom by Kalayna Price is the latest book in her Grave Witch series. This is is one of my absolute favorite fantasy series–I love its perfect combination of mystery and fantasy! Really hoping there will be another one in 2018. 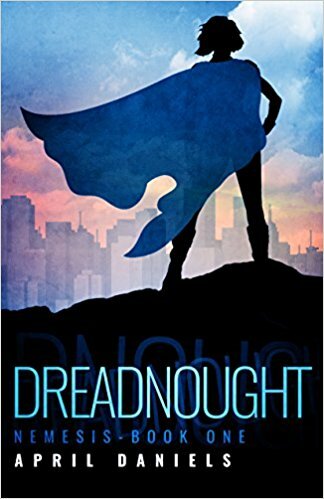 I really enjoyed the two books that came out this year featuring a teen transgender superhero-written by April Daniels-Dreadnought and Sovereign. Stephanie Gayle came out with the second book in her series featuring a gay police chief, set in the 1990s-Idyll Fears. 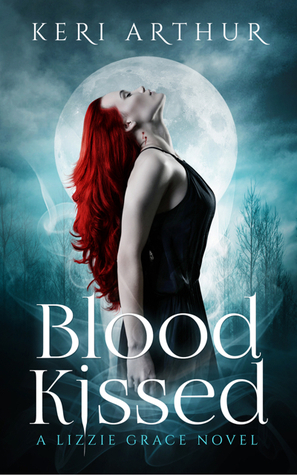 I had the pleasure of reviewing two books by another of my favorite fantasy authors, Keri Arthur–the latest in her Phoenix series Ashes Reborn, and the first in a brand new series-Blood Kissed. 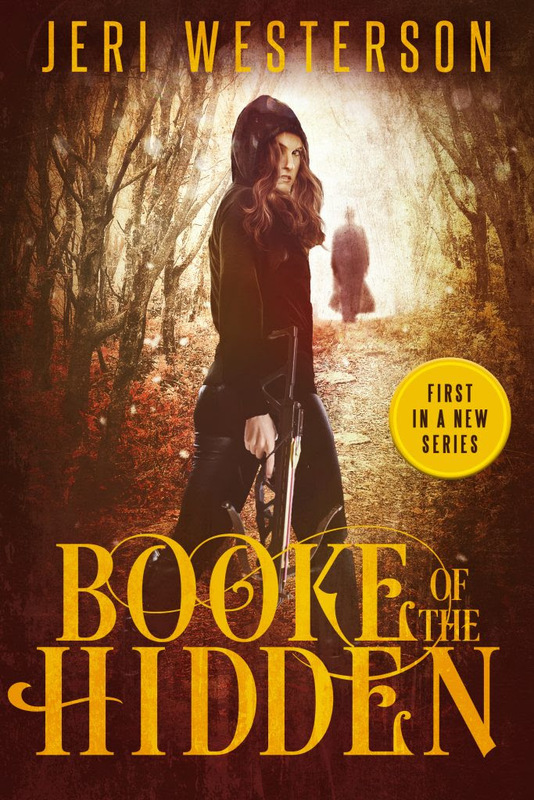 Another of my favorite mystery authors, Jeri Westerson, ventured into the fantasy world with the first book in a new series-Booke of the Hidden–I look forward to book two! The one non-fiction book I reviewed this year was an absolute treat-The Adventures of the REAL Tom Sawyer by Tom Sawyer. 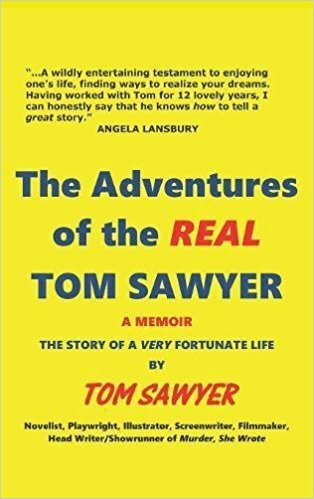 Tom Sawyer was one of the main scriptwriters behind one of my all time favorite TV shows, Murder She Wrote, and it was a delight to read about his interesting career and especially his time working on MSW. 2017 was another great year for books, and I am sure 2018 will be as well! Keep up with all of our book reviews in our Books & Tales section and over on our new blog KRL News & Reviews, and please share in the comments some of your favorites from 2017!